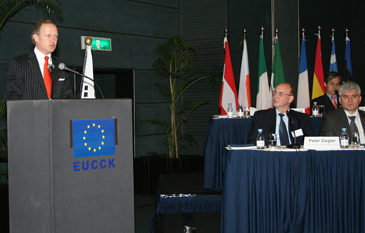 Mr. Peter F. Thewlis, Acting President, the European Union Chamber of Commerce in Korea (EUCCK) today called upon the government to address a number of lasting trade irritants that have been plaguing the EU business community in the country. Addressing the annual press conference on Trade Issues & Recommendations, he noted that the Korean Government has embarked upon an ambitious FTA strategy with a number of its trading partners. In light of these developments, the former Prime Minister expressed last December his view to the EUCCK that Korea was supporting an FTA with the European Union. "The European business community in Korea warmly welcomes such a move, provided that is, a number of lasting trade irritants between the two parties are addressed and solved once for all," he said.